After our cruise to multiple islands in the South Pacific on Oceania Marina, we spent a day driving around the island of Tahiti in a rental car. Since there is only one highway on this circuit, it’s an easy drive for visitors. 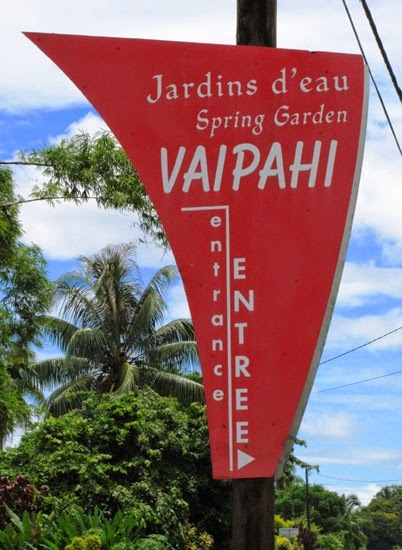 We started just outside Papeete and headed eastward for 30 miles, stopping first at the beautiful VaipahiGardens on the south coast. Restored in 2007, the public gardens are a serene combination of water, light, and natural beauty. We wandered through a good portion of the garden’s 2.5 acres, paying no attention to the light rain falling at the start of our excursion. Along the way, we learned about the island’s cultural heritage because the gardens include archaeological relics and signs explaining legendary traditions. 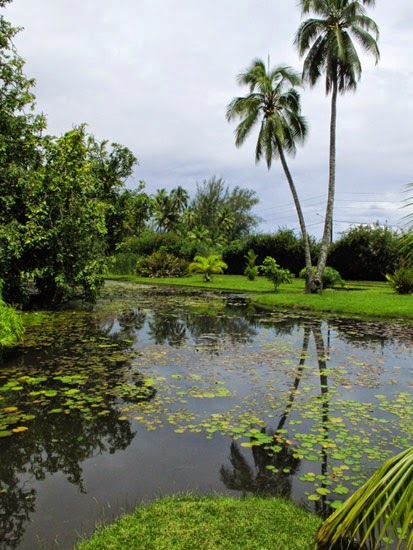 There over 75 different species of vegetation, all kept fresh by water from Lake Vaihiria in the center of the island, Tahiti’s only fresh water lake. According to ancient legend, the nearby Vaima River once played an important religious role because the spirits of the former Teva tribe considered this waterway as “the path of purification of souls” in their quest to reach paradise. 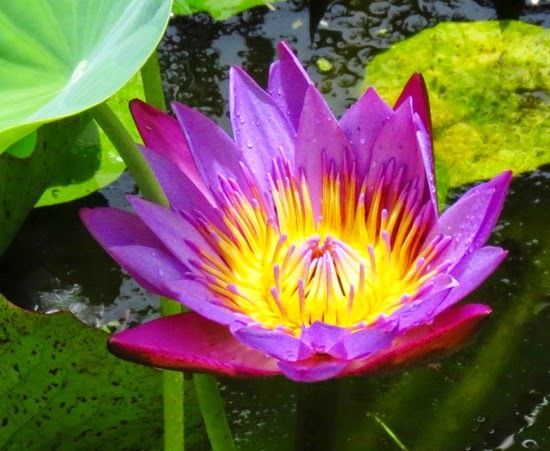 Pleasant paths invited us to walk among exquisite vegetation and sumptuous blooming flowers. Each of the three walkways takes about half an hour to traverse. One takes visitors along marked paths next to the river. Shaded by trees, the walk ends at a plateau with overhanging cliffs and a spectacular view of the entire park and gardens. True to its tropical island status, varying shades of blue shone from the lagoon and ocean. 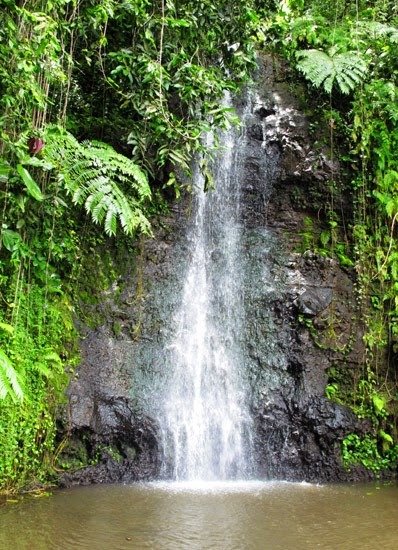 Natural grottos, splashing waterfall, and exquisite tropical flora--bird of paradise, ginger, lilies, petunias, flame flower, and so many more that I don’t know the names of—made us feel like we had found a Tahitian paradise at Vaipahi Gardens. 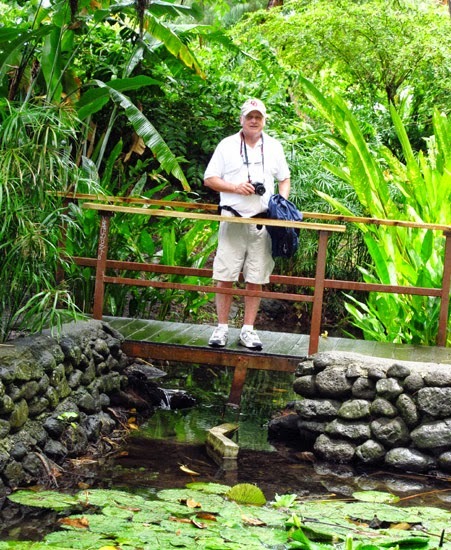 We visited these gardens, too, after our Windstar cruise. We took a half-day tour of the island and these gardens, along with the waterfall, was a highlight. 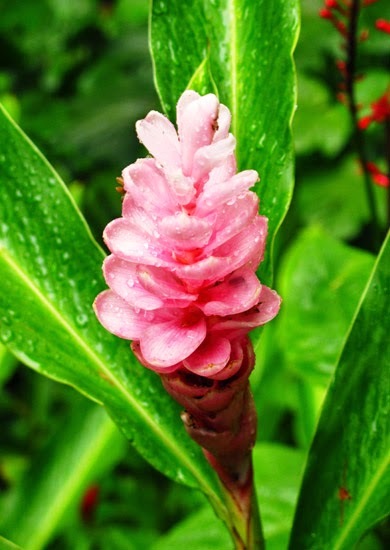 I love the tropical foliage and colors that are found throughout the South Pacific!